My rant for today is clothing manufacturers and their completely arbitrary sizes. This weekend I was in Old Navy and bought two light weight polar fleece pullovers. In a size medium. Anyone who has met me knows that I am not medium sized. When I shop at Ann Taylor I am an XS or S if I want whatever it is to be roomier. It annoys me that there is no consistent sizing. And not just between different manufacturers, but even within the same store. But my love for these new pullovers overcame my annoyance and I bought 4 more today. I love them. They fit me perfectly. Are the perfect warmth and aren’t too bulky. And the fact that I love them means that Old Navy will stop making them. Because that is just the sort of luck that I have. Yesterday I was all set to write about my rant of the day, when the day just seemed to get away from me. It was old people driving. And I don’t really mean in it a funny, ha-ha, those old people kind of way. I mean in it in a my God why are these people still allowed to drive. When I had to get my driver’s licernse renewed this summer there was an elderly woman getting her license renewed. She could not walk from the seat to the counter unassisted. She could not read the paperwork in front of her. She could barely hold the pen and sign her name, she was shaking that much. I was standing behind her and her “helper” and when I got up to my turn I said, “Now she isn’t getting a driver’s license, is she?” Oh I thought I was being funny. “Why yes, she is.” the woman answered. I looked back to the waiting area where this frail woman was sitting, and looked back at the woman behind the counter. “That is just frightening.” I said. And it is frightening. While I feel bad for old people and the loss of independence that would come form no longer being able to drive, there should be some sort of testing that occurs once you reach a certain age. Then today I got a email in my inbox from a mother who lost her 3 yr old son. A elderly senile driver and a seatbelt in a car that gave way. And well, watch it for yourself and become educated. I frequently get emails asking me about bedtime and to share my routine. I have resisted mostly because it is chaotic and not very worthy of holding up as some sort of shining example of having it all together. I am all about bedtime, as in the time my children go to bed, not the time they go to sleep. To me there is a difference. I can’t control their sleep habits, nor do I try. All my children, aside from the youngest two. have reading lights next to their beds. They are allowed to stay up and read quietly on in their beds, play with their Leapsters, or even play a quiet card game with their room mate. Quiet is the keyword for all of these activities. If they are not quiet I will come upstairs and remind them, or yell at the ceiling downstairs. As I tell my children, bedtime is not about them, it is about me. At night I need to be off duty and relax without having to attend to the needs of other people. End of the story. Whether or not they are tired doesn’t factor into the equation at all. My 3 and almost 2 yr olds had been staying up pretty late, past the time that the others went to bed. But I took advantage of the time change to push both of their bedtimes back. My 3 yr old is now going to bed between 7:00 and 7:30, and she is falling asleep almost immediately. She used to spend the 7:00 hour completely would up, running around like lunatic and making her siblings who were trying to relax angry. I have found that children, generally speaking, act wild and hyper when they are tired. It almost seems counter-intuitive, but sleep seems to beget sleep. Bedtime is my least favorite time of the day. It is usually chaotic feeling. People are tired and cranky and I don’t have a much left in the way of patience. I really just want everyone to get with the program and shower, brush their teeth and put on their pajamas like they do EVERY SINGLE NIGHT. But yet, every night they act as if they have never brushed their teeth, showered, or worn pajamas. And inevitably I end up yelling at someone for something and then I feel bad, because who wants to end their day on a bad note? Last night I tried to jot down everything as it happened so that I could “live” blog it. It is pretty much the same every night, just switch the kids and the scenarios around. Why can’t anyone else in this family see that the garbage can is full? 1) If you try to put something into the garbage bag/can and it falls right out because there is garbage piled up to the rim, do not ignore your garbage that is now laying on the floor. 2) Similarly, if you try to “make a basket” with some garbage and miss, there is no other person who is going after your missed shot. 3) If the garbage can is filled all the way to the top you may not throw your garbage on the counter, floor, or sink instead. 4) DO take out the old garbage bag and tie it up. AND PUT IN A NEW BAG! 5) If you throw garbage into the empty can because you “can’t find” the bags I will make you wash out the can… with your toothbrush. If you put something really stinky in the garbage like old food or a dirty diaper, please tie up the bag immediately and bring outside, even if the bag is not filled to it’s breaking point yet. 9) And by outside I mean the garbage can that is outside, not tossed out the back door where animals will come and tear the bags open and spread the contents all over the yard. 1) If you are putting packages into you car, but intend to go back into the store for more shopping, you should wave on any cars who stop and wait. So that they, and those trapped behind them, can move on. 2) If you see someone leaving a store do not follow them slowly through the parking lot. That is just weird and creepy. And then when you sit there in the car you seem so annoyed while they put their packages in the trunk, put the kids in the carseats, eat a snack and apply some lipstick. No one is forcing you to wait there. 3) People who stop in the parking lot close to the store entrance and wait there for a parking spot to open up, when there are plenty of other ones available further back in the parking lot. And while I understand that some people might not be able to walk far and could benefit from the proximity of the mall entrance, surely the amount of people I see doing this are not all incapacitated in some way. Find a spot that is already vacant or else stay home and out of my way. 4) This isn’t really in the parking lot, but if I hold the door open for you at the mall entrance, I expect a thank- you. You don’t have to genuflect, kiss my rings, or salute, unless you want to. Just a simple, “thanks” will suffice. Parents who don’t parent their children. It didn’t lessen his anger towards me, which really was fine with me. I got the eye roll and the stomp out of the room. I am not about to deny anyone their feelings, even if I think they are over reacting. But everyday I am amazed by the number of parents who refuse to parent their children. Who refuse to set any boundaries at all. Parents who live in fear that their children won’t like them if they ever say, “No.” I feel sorry for the children, who keep upping the ante looking for some boundaries. And I feel sorry for the parents who feel like nothing they ever do is enough. So my advice to all the parents out there… get some friends your own age. I didn’t even plan it. Yesterday I finished up that previous post and went to update the links on my other blog. As I typed them into my template I realized I have spent the entire month talking about food, groceries, and getting the kids to eat the food. No wonder I am tired of this topic. Enough with the food posts, woman. We know you have to cook lots of food. Every. single. day. In honor of NaNoBloMo, which I did not sign up to do because my god…the pressure!!! I am going to share a rant a day, until I run out of things that annoy me. So that should be awhile. Salad dressing that doesn’t have the little shaker top thingy inside. So when you try to sprinkle the dressing on your salad it ends up drowning it instead. Newman’s Own Italian dressing…. I’m talking to you. It always makes me laugh. Mostly because the increase in the amount of food that I need to prepare has gradually increased over the years. I am sure if one day I were single and then the very next day woke up and had to preapre meals every day for nine people that I would find it overwhelming. A few months ago my friends Darren and Nabby came to visit. Neither of them have children. At one point during the evening Nabby looked over at my cabinet filled with food and said, “Wow, that is alot of food. Are you stockpiling or do you eat all of that?” I thought it was funny because to me it was looking a tad barren. I buy bread 6 loaves at a time. That will last us for three lunches. They can go through two entire boxes worth of cereal in a morning. My children are big eaters like their father, and luckily they have inherited his metabolism. I have always thought those plans where you cook once a month and freeze all the food would be really great, except that the sheer volume of food that I would have to prepare is overwhelming. In some ways my everyday cooking is bulk cooking. I love reading both of your blogs. I was wondering if you could write about meals that you cook for your family? I “only” have three kids and can’t imagine cooking for that many people everyday. It would be like having guests every single day. How do you manage? Do you have any favorite, kid approved (ha-ha) recipes? This is one of the many emails that I have received asking the same basic question. This one mad me laugh the most though. My children are not treated to meals that would be considered holiday or guest worthy every day. I have already expressed my love for the crockpot in the previous post. But not every meal can be put into a crockpot. Nor do I want to make every meal in a crockpot. In the summer I cook on the grill a lot. I love my grill. But now that the weather is turning colder and soon it will be snowing, I have less desire to stand outside grilling. And it is time to move on to the “winter” recipes. God, I am old and boring if I can categorize my cooking by the seasons. This recipe is super easy and fast to prepare. One of my favorite ones to make when we are pressed for time in the evening because of activities. It is not a measuring dependent recipe, so feel free to add more or less of the ingredients. Brown the beef in a large skillet. Drain the fat. Add the tomato soup and salsa. Let simmer. Serve on buns. Sprinkle it with mexican blend shredded cheeses if desired. Serve with a tossed salad and some corn chips. We also like fun meals. The kinds where the kids can help, serve themselves, or make their own version of the meal. This is a favorite on a Saturday or Sunday evening when we are going to be watching a sporting even or family movie together. Buy the chicken wings and tiny legs. Toss with the hot wing sauce and broil. Same as the recipe above, but with teryaki marinade. Vegetables and ranch dressing dip. I put all the food out on the table and they pick and chose what they want. This dinner is especially fun if you eat it in your tv room on a blanket spread out on the floor like a picnic. *I also do the same but with chicken tenders and then serve it with dinner sized rolls to make little sandwiches. Who doesn’t love pizza? For a long time I was too intimidated to make pizza. It just seemed so HARD. Now I am not sure why I thought that, but if I thought it I am willing to bet that some of you think it too. Trust me, if I think it is easy, you definitely will. I pour the water and oil into the bottom of the bowl. Mound the flour and salt in the middle. Dg a little depression in the top and stick the yeast there. So that when you stir it the yeast comes into contact with water after it has mixed with throughtout the flour. Stir it all up until it is mixed. Split it into three balls. Now you knead the dough. Or punch it. Knead each ball of dough on floured surface until it is smooth. Use your own discretion at the amount of flour you would like to use. 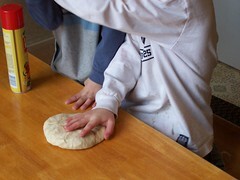 With a rolling pin, roll the dough out flat. Spray your baking sheet with cooking spray and dust lightly with cornmeal. This will help it just slide off the pan when it is done cooking. I put the dough in and let it pre bake for 7 minutes. This helps it get crisp without keeping it in the oven long enough for the cheese to burn. 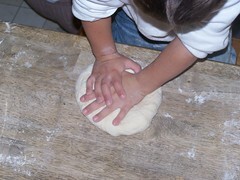 The kids all love to help with making the dough.My older kids can do all the measuring themselves and really only need minimal supervision. And best of all, they think it is FUN. The crust can also be wrapped up and frozen at this point to use another time. Fpr something like Breakfast pizza. Now comes the toppings. The choices are infinite, depending on your likes. I like to have a variety of chopices and ask the kids to personalize what they want. I have found that they will be more adventurous in their choices if they put it on themselves. My big pizza making tip is to USE LEFTOVERS! Make some chicken breast for dinner and have a tiny bit left over, not enough for a full meal? Slice it up and freeze it in a small ziploc. We have even done this with sloppy joe mix, adding it on top of the jar pizza sauce with a little mexican blend of shredded cheeses and had mexican pizza, Ole’. Teryaki chicken… well that makes an interesting Asian inspired pizza, if you add a little pineapple and green pepper. I use inexpensive jarred pizza sauce. Spread it around the crust, sprinkle the toppings on and throw it back in the over for another 7-10 minutes. It really is so simple to make homemade pizza. We almost never buy it anymore, in part because the kids enjoy making it themselves so much. Those are the top three easiest to prepare kid picked- mom approved meals. I sound like a Jiffy peanut butter ad now don’t I? You are currently browsing the A Year Off weblog archives for November, 2006.